You have almost certainly heard the phrase “a picture is worth a thousand words”. That expression, which first appeared in a 1911 newspaper article, holds true to the present day. It conveys the notion that a complex idea can be conveyed with just a single still image, often conveying its meaning better than a textual description. If you know where to look, many awesome historical photos are readily available from the Library of Congress to help tell your family story. The large stash of historical pictures at the Library of Congress (LOC) can be searched for help describing events your ancestors experienced first hand. For example, you may be able to find a picture of the ship your grandfather served on during the war or find a picture of a depression era soup line to add visual context to the events of your ancestors lives. One example of the power of an image can be seen at the top of this article courtesy of the Library of Congress Photo Collection. 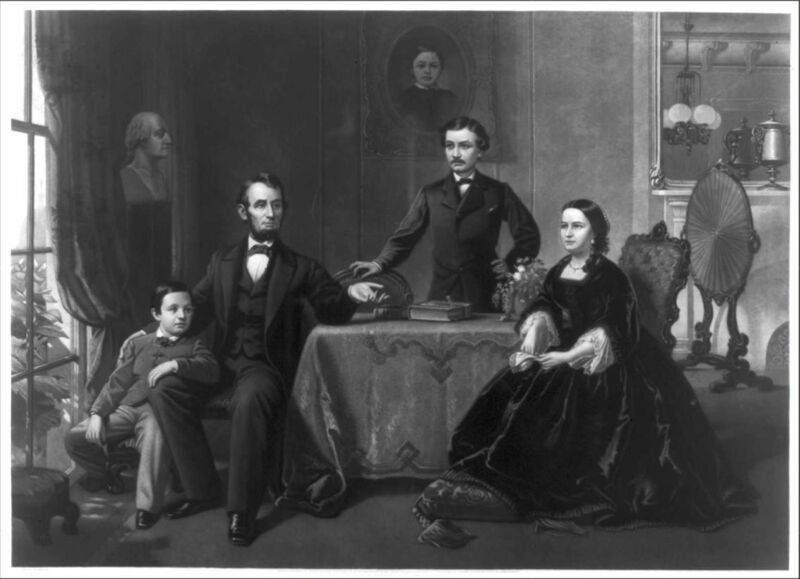 The image depicts an image of Abraham Lincoln and his family including sons Willie and Tad. For me, this single image tells a story that goes far beyond what we were taught in school. The image reminds me of the incredible hardships the Lincoln family endured as their family was torn apart. These include Willie’s death at age 12 of fever, Abraham’s struggles with clinical depression and assassination in 1865 at the end of the Civil War, and a suicidal Mary Todd being committed to an asylum after the death of her husband. This single image of the Lincoln family packs a powerful visual punch in its depiction of our 16th U.S. president. A single carefully selected image can be just what you need to transform dry facts into a coherent story that deeply resonates with your reader. The one thing that scares most people away from using images taken from internet sites is the fear that someone will come after you for using the image without the owner’s permission. It helps to have a basic understanding of U.S. Copyright law. The biggest issue is how you plan to use the image. If you just want the image for personal use, maybe to share with the folks in your genealogy group, that falls under the “fair use” clause of the Copyright Act. If, however, you plan to display the image on your website or in a published book you will need to obtain permission from the owner, unless the image is deemed to be in the public domain. Where can I find free images that are in the public domain? If you have an Ancestry.com subscription, photograph images can be found at Ancestry’s Library of Congress Photo Collection which contains a subset of public domain only photographs from the overall LOC collection. This means you are free to include photos you find there on your own websites or in other published works. The entire Library of Congress print and photo collection can be searched from their website at http://www.loc.gov/pictures/ Just keep in mind that you are responsible for obtaining the necessary rights before you publish them. You need to find out who the owner of the picture is and refer to the web page at http://www.loc.gov/rr/print/res/index.html to explore their permission policy. With a little imagination and some help from the LOC Photo Collection, there is no telling what you may be able to find to make your family story come alive. You can either use the public domain images from Ancestry or go straight to the source and deal with any possible copyright issues.